A child care provider's income is inconsistent and usually not a lot. I have to keep my costs low. I stick to a tight budget. My grocery budget is our only flexible expense. Sometimes I have to stretch it very, very thin. What a difference a year makes! Up until June of 2008 my weekly shopping routine was to go thrift store shopping, go to Wal*Mart (which was NOT a Super Center) and pick up cleaning supplies, health and beauty items, diapers, paper products, etc., then go to a grocery store to get the weekly groceries. 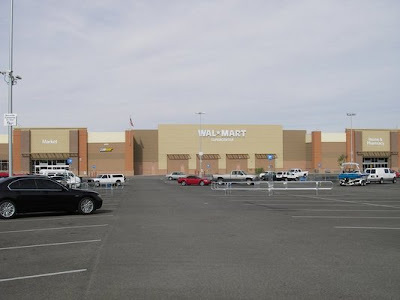 In June of 2008 Wal*Mart moved from the end of town to a new Super Center eight miles out of our town. I live on the opposite end of where they moved it, so I'm up to a 24 mile round-trip. With the climbing gas prices, it was no longer a quick run or on my way to thrift stores. I was certain the Super Center prices and variety would make up for the cost of driving out there. It was lots of fun shopping in a new, big store! The household items, health & beauty, hardware, electronics, pets, etc. departments contained pretty much the same items as in the old store and the same prices, too. The new grocery section was fun to shop in. The prices are good on just about any packaged item, frozen item, dairy, and more. They have more variety and brands I haven't seen before. Although I really enjoyed shopping there, it was hard for me to justify spending that much in gas money every week. I reorganized my budget to make it a monthly trip to Wal*Mart. That was half our monthly grocery budget for a once-a-month trip to Wal*Mart for groceries and paper products, health items, pet items, etc. The other half of our budget was spread over three or four weeks of going to a more local to me grocery store and getting milk, produce, etc. that we needed for the week. I shopped like that for several months and made it work. I became more and more unhappy about it though because each month I would shop I would notice Wal*Mart was out of an item I used to buy there all the time and I would never see it again, the prices kept creeping up, and the last straw was when the big box of Parent's Choice diapers were shrunk down to 10-20 less diapers in the box and the price stayed the same. My mindset until then was that I would keep my grocery spending low if I bought non-food items at Wal*Mart, but with all the changes, would I? Earlier this spring, I decided to see if I could make my budget work without a Wal*Mart run. Could I actually stay in my budget by shopping elsewhere? There were many years in my life when I believed I could not live without Wal*Mart. Well, if it doesn't work out, I can take my 24-mile round trip any time I need to. I think May was the last regular trip to Wal*Mart and I was on my way to find discount prices elsewhere. To my surprise, it wasn't that hard! One of my biggest expenses is diapers and I started with that. I can find comparable generic diapers at Walgreens, Kmart or Smith's (Kroger), but found I can get Luvs for the same price per diaper through Amazon.com or Diapers.com. They all offer free shipping with a $50 order (some sites less). So now, diapers, Huggies baby wipes (comes to about the same price I can buy them at the store), baby powder, diaper cream and other supplies are delivered right to my doorstep for the same price as going to a store and buying the same amount of diapers and wipes. I've found many grocery-type items at Amazon.com and have ordered several from Nestle Quick to shampoo. The trick is to look for items that are offered for free shipping for orders over $25, then order at least $25 worth of items. So what about the other items I would buy at Wal*Mart? It's not hard to catch toothpaste on sale or deodorant in a clearance rack or something. Our Smith's store has a clearance rack that I regularly go though. I've found pet items, baby formula, toiletries, and other items for good prices. Sometimes you have to be a little flexible with your brands and such. Also shopping at our Family Dollar store for laundry soap and dish soap has helped. Reading the store fliers weekly and taking advantage of the loss leaders is a great strategy. Over-all, I went six months without going to Wal*Mart at all! I didn't miss it or wish I could go. Didn't even think about it. I spend a few more minutes a week reading the sale papers and spend a little extra money if there's something I use all the time on sale and stock-up. I'm very happy with my new shopping routine. What got me to go to Wal*Mart after six months? Camera shopping :). After looking online and calling around to stores, Wal*Mart had the best price, so for that, we took the trip. Also, I did go to the Black Friday sale (but well after they had opened--somewhere around 9am) and didn't buy much. So, I've learned I CAN live without Wal*Mart. I think I've learned a new way to use Wal*Mart--to my advantage. Great Post! 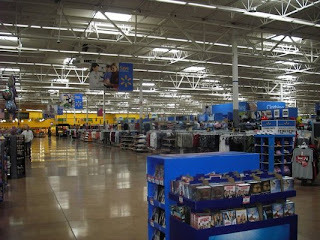 Wal-Mart is a good distance for me too, and I have been shopping elsewhere. Like you, I can find a lot of items I want at Family Dollar or Dollar General and the same or lower price. The other big difference is time - driving time -shopping time. You can get in an out of the smaller stores in just a few minutes! Oh, and I love Amazon.com too! Enjoyed reading your post! I just came out of Walmart while ago. I was shocked at how much everything cost now! I had also been shopping at the local Dollar General and getting groceries nearby. I don't know if you have a Dollar Tree near to you, but I shop there quite a good bit! Everything in there is a $1. Honestly I try to avoid Wal-Mart because I hate that they're taking over the world. I'd rather try to shop as locally as possible, if I can. You're right that with coupons and time you can find most of all those health and beauty products for cheap, cheap, cheap, if not free. Have you checked out Alice.com? It might be useful for your needs. For the future, Best Buy will price-match anything--if you're really avoiding the Wal-Mart run!